Cheapeats was honored to be a taste tester for Panera Bread and Daily Buzz Food. We gladly accepted our $10 gift card and went off. We decided to check out their cafe in Union Square after Yoga. Hunger were filling our belly, as well as trying to be healthy. Can we satisfy our hunger without breaking the bank and our waistline? Let’s see. It was a chilly night, so soup sounded like the perfect answer. 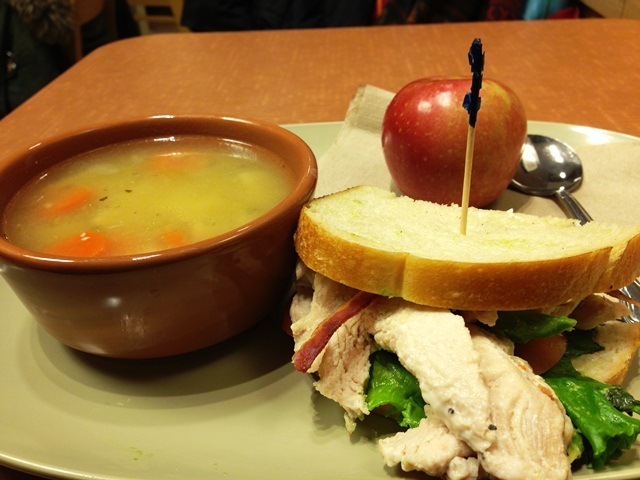 We studied their menu, when something caught our eye – “PICK 2.” We can order a bowl of soup and half a sandwich? What’s better than soup and a sandwich, especially for around $7-$9, depending on the sandwich. After a workout, protein is needed, so we decided to go with Chicken Noodle Soup and Turkey Sandwich. “Would you like chips, roll or an apple with that?”; we’re asked. Keeping focused, we go with an apple. We were given a number and sat at our table. Within minutes, a smiling girl set a tray down in front of me and was told to “Enjoy.” One look at our meal and we knew we would. The Chicken Soup had large pieces of carrots, celery and onions, with chunks of white meat chicken and wide egg noodles, and swimming in a rich and hearty broth. YUM!!! Tasted like it was homemade…right from your kitchen. The Turkey Sandwich was hand carved turkey breast, that was antibiotic free, with mesclun greens, tomato, applewood smoked bacon, with a dab of reduced fat olive oil mayonnaise, on country white bread. No processed deli meat or limp iceberg lettuce here. The turkey was moist and the bacon was crunchy. Just like a leftover Thanksgiving sandwich. Mmmmm. I have to say, I was quite pleased and satisfied with my meal. It was tasty, cheap and healthy. I was even able to plug in my meal into My Fitness Pal app on my Iphone. My sandwich choice was a premium, so I did go over the $10 budget by $.39. Mission accomplished and nibbled on my fresh apple on the walk home. This entry was posted by Rosemarie on Tuesday, December 4th, 2012 at 11:29 am	and is filed under American/Comfort, Bakery, Flatiron District, Gramercy, Manhattan, Organic/Green, Union Square. You can follow any responses to this entry through the RSS 2.0 feed. You can leave a response, or trackback from your own site.